Party Magician and Entertainer for hire for any Event or Function. A party without entertainment is a like a meal without food. A bold statement but something that Chris strongly believes, as a party magician Chris has performed at countless birthday parties, masquerade balls, anniversaries, Christenings, School Proms, Exam celebrations and more. 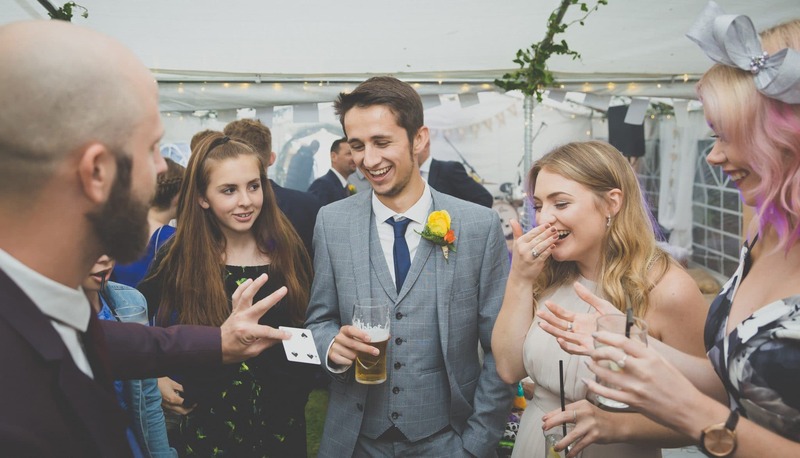 Hiring Chris as your Party Magician is the perfect way to ensure that everyone isn’t JUST entertained but they are left with memories from the night that will stay with them forever and that they will want to share and spread around. Chris is a dynamic, fresh and contemporary party entertainer and as such he feels completely at ease performing whether it is to excitable, somewhat inebriated young’uns at an 18th or 21st birthday or whether is at a multi-generational family get-together for a 90th birthday. Take a moment to view the video below which shows Chris performing at a Great Gatsby Themed Party recently – this shows off exactly the sort of fun, laughter and reactions that Chris’ magic can bring to your event or party. How long should I Hire a Party Magician for? When hiring Chris to perform at your Party or Event one of the questions he will ask will be how many people are likely to be there. The number of guests directly reflects the sort of entertainment that Chris can offer and will largely impact the length of time Chris performs for. For Parties of less than 30 people it might be best for you to look into Chris Parlour Show which can be found on this page. For Events where there are between 30 and 50 guests, a one hour performance is sometimes enough but it does mean that Chris does not get very long to perform with each group of people. Parties where there are between 50-100 guests should hire a Party Magician for 2 hours but it is sometimes sensible to book him for longer if your budget allows. Any events with over 100-200 guests would require Chris to perform for the whole evening – typically a 4 hour package. If you are organising an Event of any sort where there are likely to be over 200 guests and you’d like to hire a Party Magician then Chris can arrange to perform at the event with the help of a Second Close-Up Magician who he can personally recommend to do an excellent job alongside him. Should I have Chris perform Hypnosis at my event? Other than being a party magician Chris is also a qualified Hypnotist, these separates from a lot of other magicians whose skills reside solely within magic. Chris’ demonstrations of Hypnosis and Hypnotic Suggestion are packed full of laughter, confusion and down right fun, Chris avoids causing embarrassment and ridicule to anyone that decides they wish to be involved with the performance. In fact such is the terrific experience that the hypnotic subjects have they often end up being the envy of everyone in the room! Chris will not have people dancing like chickens, but he will have people forgetting their name, being unable to count, imagining beautiful fairies flying around the room and doing ANYTHING to protect them. Speak to Chris to find out if Hypnosis is the right thing for your event. Hypnosis should not be performed at any event where there are under 18s present. Updated on 2017-12-12T09:29:30+00:00, by Dorset Digital.